News sources are reporting that golf is losing its popularity in America, but last I checked, people still love the sport of golf. Maybe it’s fake news! But either way, golf clubs (and green fees and beer) are expensive! Luckily, there are several online stores that carry golf clubs that allow you to buy golf clubs now and pay later with deferred billing options so you can make payments on golf clubs! Gettington lets you choose to pay back in 4 payments or up to 24 monthly payments on thousands of products including Powerilt Pro and Callaway golf club sets and more. The application takes under a minute. If you already have a Gettington Credit Account, click here to shop! TaylorMade Golf sells golf drivers, fairways, rescues, irons, wedges, putters, golf balls and accessories and accepts Klarna for payment. FlexShopper carries name brand golf clubs and more that are available to rent to own in 12 months of less for as little as $2 per week. Qualify today for up to $2,500 instant spending limit with no money down and no hidden fees. Bad credit is okay. Shop FlexShopper.com now! Fingerhut carries Callaway and Powerbilt golf club sets plus thousands of other name brand products with no down payment and no layaway. Affordable monthly payments. Fingerhut says “Yes!” when others say “No” even if you have bad credit. If you already have a Fingerhut Credit Account, click here to shop! 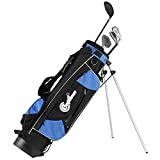 Amazon offers a free $50 gift card for applying and getting approved for their Amazon Rewards Visa Card that you can instantly apply towards a new set of golf clubs plus earn 3% back on your Amazon purchase. Shop Amazon.com now! American Golf offers 0% interest free credit up to 18 month term when you spend over £250 instore or online. Despite the “American” name, they do not ship to the US (they are UK based). The following online stores all sell golf clubs AND accept PayPal, so you can choose PayPal Credit (formerly Bill me Later) at checkout to make monthly payments. Make no payments and pay no interest if paid in full in 6 or 9 months. Can’t find the golf clubs you’re looking for? HonestLoans offers loans up to $5,000 for any reason, whether it be for home improvement, vehicle repair or a vacation. Some online stores that sell golf clubs accept other forms of financing such as Affirm, FuturePay, zipMoney or zipPay. Do you think the sport of golf is dying in America?